Regardless of the industry you’re in or the type of software you’re developing, you’ve most likely been mandated to comply with one or more coding functional safety standards to ensure the compliance, security and reliability of your software. Use this cross-industry cheat sheet to see what matters when it comes to security, quality coding, and functional safety standards. Klocwork is certified (pre-qualified) by TÜV SÜD for use in ISO 26262 projects. 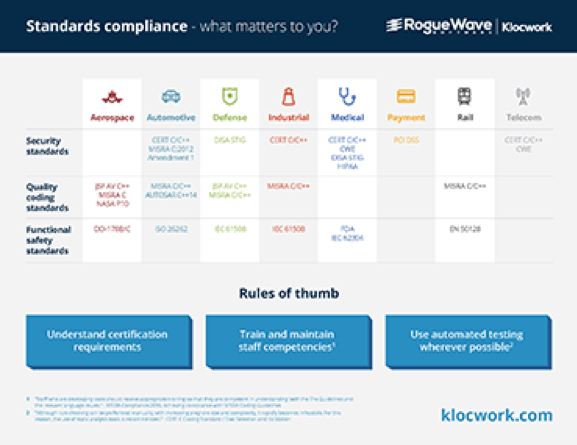 Klocwork’s analysis can be used to cover a range of guidelines specified in Section 6 of the standard, Product development at the software level. Klocwork’s client-server architecture simplifies and streamlines the process of managing compliance to coding standards, such as MISRA, which form a key feature of the ISO 26262 requirements from the static analysis aspect. Klocwork is being used successfully in safety-critical and high-integrity embedded systems where system faults are simply not acceptable and, in many cases, compliance with industry standards is required (IEC 61508, ISO 26262, EN 51208, IEC 62304, DO-178B/C, MISRA etc). For more information on Klocwork static analysis tools, standards compliance or to arrange a 7-day free trial, please complete the form below.